Many pool chemicals are used to sanitize, clean, or balance the water in swimming pools, hot tubs, and spas. A partial list of pool chemicals includes chlorinated isocyanurates, lithium hypochlorite, sodium bicarbonate, potassium monopersulfate, hydrogen peroxide, sodium hypochlorite , calcium hypochlorite, and certain ammonium, brominated, copper and silver compounds, and muriatic acid. Pool chemicals involved in fire or toxic vapor releases are likely to include those that add chlorine or a chlorine ion to the pool water for bacterial control. Chemicals that release chlorine are among the group of chemicals classified as "oxidizers." These pool oxidizer chemicals include calcium hypochlorite, sodium hypochlorite, and chlorinated isocyanurates. Other pool chemicals are used to control the growth of algae or fungus, to adjust the acidity or alkalinity (pH control) and to clarify the pool water. The pH of a pool is controlled by adding either acid or alkali products. An acid, either muriatic acid (also known as hydrochloric acid) or sodium bisulphate, is added to lower the pH. To raise the pH, an alkali, sodium carbonate (also known as soda ash) is added. Additionally, pools use sanitizing chemicals to remove algae, harmful bacteria, dirt, germs, and organic matter carried into the pool on people’s bodies and by the wind. These chemicals oxidize organic matter. Most typically, a chlorine product is used to sanitize the pool. Either a liquid chlorine (typically sodium hypochlorite) or dry chlorine (usually calcium hypochlorite) is used. Pool and spa chemicals may be corrosive, meaning they may cause skin and eye damage. Many pool chemicals, including different types of chlorine, can react violently when mixed, producing toxic gases, fire, and/or an explosion. Sodium hypochlorite, the active ingredient in most pool chemicals, can irritate eyes and skin. Do not allow chlorine tablets, pellets or flakes to get moist or wet, as they will start to emit highly corrosive and toxic chlorine gas! Do not attempt to transport moistened chlorine tablets, pellets or flakes – you may not survive the trip! Sodium hypochlorite is highly reactive; can cause fire if in contact with organic materials. Click here to download a PDF flyer developed by the MCMUA regarding the safe use and disposal of pool chemicals or click here to read an EPA safety alert on pool chemicals. Do not mix with ammonia or vinegar as it will produce toxic chloramine gas. Do not dispose of in the trash or down the drain. Take to HHW collection day or hazardous waste facility. 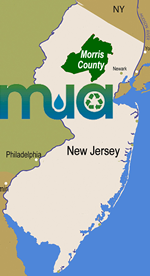 In July 2003 and July 2008 fires occurred at the MCMUA's Mount Olive transfer station. In both fires it is suspected that a small quantity of pool chemical was improperly disposed of in the regular trash. When dumped on the tipping floor at the transfer station it mixed with the moist garbage and the leachate (liquid) generated in the garbage. This likely caused the pool chemical to start reacting and oxidizing. This in turn generated the heat and the oxygen necessary and sufficient to ignite the entire pile of waste on the tipping floor.